At a time when “artisanal” and “sustainable” are becoming more than just buzz words in the food world, some elements of the bar realm have yet to catch up, their garish artificial colors and lab-formulated flavors as out of place in a Slow Food culture as a naugahyde La-Z-Boy in a Four Seasons. But bartenders are increasingly seeking ingredients more in tune with a progressive culinary philosophy, and some are tapping their creative talents and entrepreneurial drive to bring more natural, authentic flavors to the bar. “Cocktails are starting to catch up to what the food movement has become, with the Alice Waters approach,” says Jennifer Colliau, a longtime bartender at Slanted Door in San Francisco, who harnessed her inner Alice in 2007 when she launched Small Hand Foods, a one-woman company that produces cocktail syrups for Bay Area bars. Made with an emphasis on quality, local, organic and seasonal ingredients—and methods once common during the late 19th-century Golden Era of mixology—Colliau’s syrups fill a niche for bartenders seeking natural, yet flavorful, products where mostly lackluster alternatives existed, and some of her syrups fill a gap in which there were previously no available commercial alternatives. But while her focus is to create exceptional ingredients, her priorities extend beyond flavor. Like her friends and fellow bartenders Erik Adkins of Slanted Door and Thad Vogler of Bar Agricole, Colliau tries to gain an intimate understanding of the ingredients in a drink, including the way a spirit or a wine is produced. And her do-it-yourself, from-scratch approach extends well beyond the bar. After studying woodworking and conceptual furniture at California College of the Arts, she taught at The Crucible arts center in Oakland and constructed most of the furniture in her house, which will also be decorated with a rug she’s currently weaving on a loom she built, using wool she spun herself. Colliau has an intensity of focus and seemingly boundless determination and energy. A day off might entail canning cases of fig jam at home, or making cheese and spending eight hours cooking an Indian meal for friends, and she speaks in rapid bursts, her conversation as apt to range from her current fitness interests (formerly into boxing, she now practices krav maga, a form of Israeli street fighting–inflected martial arts) to the merits of Japanese woodworking tools and her opinions on the construction of a proper Margarita. 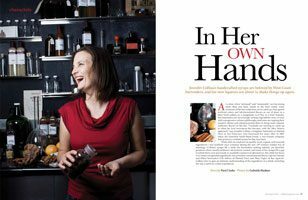 It would be convenient to ascribe Colliau’s bar projects as simply the latest outgrowth of foodie-ism, but her approach is intentionally more in line with that of the 19th-century bartenders so venerated in many of today’s cocktail bars, and her products help satisfy the demand for authenticity of flavor in old-school drinks. “Everyone knows about Jerry Thomas, but nobody knows Christian Schultz,” she says. Thomas, the patron saint of craft bartenders, published the first edition of his pioneering manual on mixing drinks in 1862, but included in that same book was a much longer work from Schultz, a chemist and distiller who listed hundreds of recipes for compounding liqueurs, syrups and other drink ingredients and bar staples. Schultz’s recipes sent Colliau down the path of researching other vintage bar manuals and recipes, looking for insight into making things like almond-rich orgeat, red currant–flavored sirop de groseille, and a luscious pineapple syrup made irresistibly silky by the addition of gum arabic in the manner of traditional gomme syrup. But not every trip through the archives has been productive. “There are reasons recipes have been updated, but you don’t know until you try,” she says—and some inquiries require more ambitious sleuthing, as with Schultz’s recipe for orgeat, which called for bitter almonds. Bitter almonds lent a deeper, more complex flavor to 19th-century orgeat, but if handled improperly can give off dangerous amounts of cyanide—hence their relative scarcity today. While researching the old recipe, Colliau discovered that a friend in the almond-growing region of California’s Capay Valley had a bitter-almond tree; after heating the almonds to eradicate the toxins and trying them in Schultz’s recipe, Colliau had a better understanding of how the syrup originally tasted. While satisfying the need for well-made bar ingredients has its merits, Colliau says the romance of running a small-batch operation wore off quickly. “There’s nothing interesting about it—it’s factory work,” she says. To make it easier and more economically feasible, last year Colliau transitioned the production of her pineapple, raspberry and plain gum syrups to a co-packer in Napa; she sources the ingredients and oversees the production, which only takes place a couple of times per year but enables her to make 200 cases of syrup at a time, as compared to the six cases in six hours it takes her by herself, and results in a greater consistency of flavor in the syrups. Colliau still makes and bottles products such as orgeat and grenadine on her own, and produces small amounts of items such as coconut cream for Slanted Door and Heaven’s Dog, along with custom syrups, such as a grapefruit cordial she makes for Teardrop Lounge in Portland, Oregon, based on a special request from bar owner and longtime friend Daniel Shoemaker. “It keeps the passion alive for me when friends and colleagues are like, ‘Can you make me something?’ That’s why I got into this,” she says. Colliau’s latest project ventures even further into the cocktail realm. Working with distiller Lance Winters from St. George Spirits in San Francisco’s East Bay, Colliau is producing crème de menthe, crème de cacao and crème de noyaux—liqueurs that factor into a number of classic drink recipes, but for which few good versions currently exist. Owing to what Winters calls Colliau’s “stubborn brilliance,” the liqueurs they’re producing under her spin-off label Still Room Spirits will also use ingredients that are fresh and ideally locally grown and seasonal—several varieties of fresh mint for the crème de menthe; California peaches and apricots for the crème de noyaux; and chocolate from a local roaster for the crème de cacao, which will be sweetened with unrefined sugar for a richer taste. “It can be complicated in technique, and it takes a lot of time to make it taste the way you want it to taste, but it’s clean—it tastes natural,” Colliau says. She hopes to introduce her liqueurs to market this year. A basic simple syrup thickened with gum arabic.